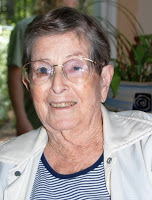 I lost my grandmother this week. For a guy who’s been bald up top for longer than he’d like to remember, it was a blessing to have a grandmother for so long. I hope there is no prohibition against telling humorous stories about grandmothers, but I’m pretty sure she’d approve. When I was young and we’d visit, she’d force her youngest son, my Uncle Larry, to share his comic books. I would lie on the couch in the living room and read Archie, Dennis the Menace, Sad Sack, and when I was older, Mad Magazine. I’d laugh till I cried. Fifty years later, my grandmother could still recall my laugh. 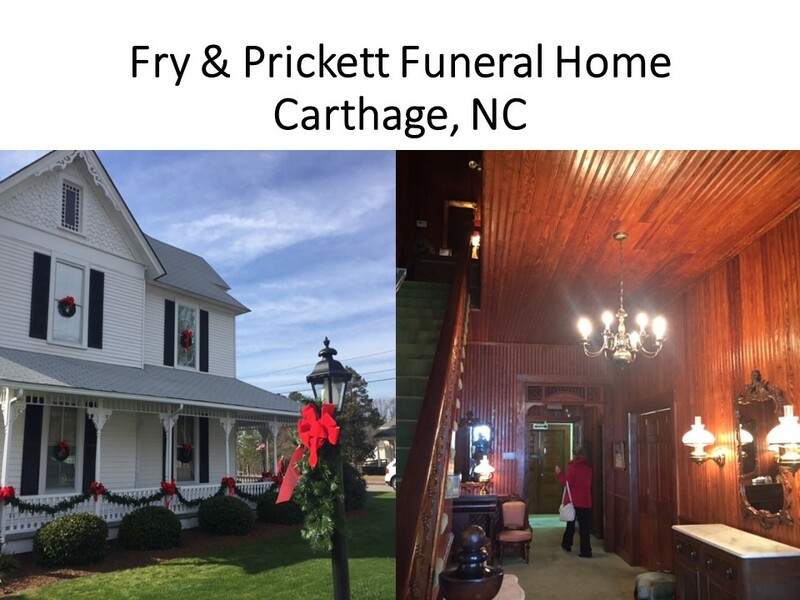 We gathered yesterday at Fry & Prickett Funeral home in Carthage, North Carolina to say our goodbyes before going to the graveyard next to Culdee Presbyterian Church. I remember my first visit to that big old house with a wraparound porch that would look, if it hadn’t been recently painted, haunted. I was seven years old. My great-grandma McKenzie, my grandmother’s mother, had died. It was in the summer and the men of the family were mostly out on the porch smoking, as many were in the habit of doing back then. No one was smoking yesterday. Few do anymore, most of those who did are no longer with us. My grandmother could have been a poster child for an anti-smoking campaign as she was the only grandparent that I had who didn’t smoked, and she outlived the three others by forty or more years. But back to that first visit to the funeral home, when I was seven. My mother ushered us kids inside and into a dark room accented with heart-pine paneling. We went up to the casket. Everyone said my great-grandma looked natural, as if she was sleeping. She looked dead. Mom pointed out her hands, freckled with liver spots, and asked, rhetorically, how many apples she’d peeled? And how many pies she’d baked? Yesterday, I looked at my grandma’s hands, the liver spots having been cosmetically covered, and thought about her peeling peaches. She made the best peach ice cream. From the time I was eleven until I started working at sixteen, I spent a couple weeks every summer with my grandparents. One evening, the summer between my seventh and eighth grade, I went with my grandparents to J. B. Cole’s orchard in West End to pick peaches. We were after big juicy peaches known as “Redskins.” They’ve probably have changed the name to be politically correct. But these were the best peaches. They grew to the size of a soft ball. When you bite into a ripe one, juice would run down your chin. They made delicious peach ice cream and look beautiful, canned in jars, where they waited to be baked into a pie during the winter. J. B. Coles was a “pick-and-pay” orchard. My grandmother wanted to get a couple bushels to can in Mason jars for winter. A few overly ripe peaches would be saved to enhance a bowl of cereal in the morning or to toss into the ice cream freezer for a Sunday afternoon treat. We were hard at work, finding ripe peaches and softly placing them in baskets, so as not to bruise them. “Did I cut one?” I couldn’t believe my ears. My stomach was a little upset and I had released some gas. But I couldn’t believe my grandmother was asking about it? Asking, “if I’d cut one,” made her sound like one of my crude classmates. How could she even tell? She was on the other side of the tree. I’d worked hard to release it slowly, without making a sound. “What? I asked, hoping I was mistaken about her question. “Did you cut one?” This time her tone was harsh and accusatory. I had just confessed to a sin I had not committed. My grandma was a saint. It’s too bad she was a Presbyterian and not a Catholic. All Presbyterians are considered saints once dead, so it’s nothing special. But the Catholics have a special category for those who over-achieve in goodness and have performed a miracle in life. My grandma was always good and she had her miracle. She’d sobered up her brother Dunk, and mostly kept him that way the last twenty years of his life. But my grandma wasn’t Catholic. In a way that would have made John Knox proud, she cast a skeptical eye toward the papists. I learned this the summer before confessing the uncommitted sin against a peach. My grandparents were visiting. We had spent the afternoon on Wrightsville Beach. I was in love that summer with Cathy Nucci, my first real girlfriend. She and I would later consummate our relationship with a kiss out by the baseball field at Roland Grice Jr. High. On this day, at the beach, we were out in front of the Lumina, the same spot where we always went. This was also the same area the Nucci family would set up camp when they were at the beach. This made it convenient for seeing Cathy in the summer as I was four years away from a driver’s license. I loved that dark hair, dark eyed girl with olive skin. We held hands while lying in the sand and played in the surf. We were an idyllic couple, Think of Burt Lancaster and Deborah Kerr in that classic beach scene in the movie, From Here to Eternity. Well, maybe not that idyllic as we were only 12. Besides, Lancaster had to fight off the Japanese. But then, I had to fight off Cathy’s older brothers as they attempted to drown me. My grandmother was born a McKenzie. You can’t get much more Scottish and Presbyterian than that. The Nucci’s were Italian and Catholic. Maybe that was why her brothers were always trying to drown me. Later that afternoon, as I was drying myself after having showered the salt from my body, I overheard a rather heated conversation between my mom and my grandma. They were in the hall and either didn’t know or didn’t care that I was right next door in the bathroom. My grandmother chided her daughter-in-law, my mom, for letting me hang out with a Catholic girl. “What if they marry? she asked. I assumed we were destined to wed. We were almost teenagers and were in love. It felt as if my own mother stabbed me in the back when she responded, “Helen, they’re going into the seventh grade. I don’t think we have to worry about a wedding anytime soon.” It turned out my mother was more concerned about me drowning at the hands of the Nucci boys than me living a long and blissful life with Cathy. Couldn’t Mom see that we were in love? Of course, Cathy and I didn’t make as a couple out of the seventh grade. As for my grandmother, my granddaddy died in my sophomore year of college. A few years later my grandmother married Earl. He was Catholic… Of course, he later converted and a Presbyterian minister, yours truly, officiated at his funeral. I have to give my grandma some credit with helping me realize my call. I was ten and we were staying in a house on Topsail Beach when I told my grandmother that I was going to be a Presbyterian minister. I am not sure what cause me to say that, as before then it hadn’t crossed my mind. I’d wanted to study volcanoes or be in the Army. Later, in my first year of seminary, my grandmother gave me a copy of Bauer’s Greek-English Lexicon of the New Testament for Christmas. When I graduated, she saw to it that I had a set of china as she felt every minister need to be able to entertain. It was good to hear from the few who remembered Grandma, as most who knew her had died long before her, and how she was proud of me. Goodbye Grandma. Thank you for encouraging me to laugh and to pursue my calling. A wonderful testament to your grandmother! I had a similar relationship with mine and I still miss her terribly, though she’s been gone for 43 years. I am so sorry to hear about Aunt Helen! She was such a sweetheart! Prayers for everyone! I enjoyed your reselling of memories of grandma. I also had a wonderful grandma and it’s been a long time since she has been gone. Thank you for sharing. I am sorry for your loss and encourage your memories. Peach ice cream! I wish I had known her. Memories are made of this. I love your stories! I had a wonderful relationship with my mother’s mother, too. Aren’t we lucky to have had good, loving grandmothers? I wish I had a Grandmother like yours. In lieu of that I have tried to be that Grandmother to my six wonderful young ones. Thank you for sharing yours. I am sorry about the peach orchard incident that has emblazoned itself on your memory. You know she is looking down and saying,”that little rascal, Jeff”. She loved you so much. SO SORRY FOR YOU AND YOUR FAMILY, SO HARD TO LOSE A DEAR GRANDMA, AND I AM SURE SHE WAS THAT. THAT PEACH ICECREAM SOUNDS GREAT.